I'm hearing this proposal is nearly at City Hall's door. That's a hell of a thing. The X is an interesting design, however it is too tall, will destroy the views of nearby residents and removes one of the last examples of heritage parking lots downtown. It must be stopped. Besides, the parking shortage will get worse and the city will be blamed even though a higher and better use of the private parking lot is being proposed. Love it! Old Town/Chinatown is getting better and better these days. 10 years ago Market Square & around it seemed so underutilized and kind of an ugly/dead zone, so frustrating given it's potential. With all these newer developments (Union, Janion, 595 Pandora, and hopefully this one, Northern Junk etc) and funkier/nicer retail going in nearby (La Roux, Union Pacific, Jam Cafe, Drake's inner patio, etc) it's getting to be a really cool neighborhood. Would still love to see the courtyard of Market Square make more use of it's potential, but Solstice has a patio now too and I did see a band there recently so hopefully that's coming together! So with the Lefevre project coming and something must be happening where Barclay's Exchange was, no? That'll make for some cool stuff. Edited by VicHockeyFan, 16 September 2017 - 10:23 AM. Good point VHF. That is a massive lot. I hope any future development on that site is very much tied in with Chinatown. I'd love for this building to be slightly taller than the new wing of the Janion and Mermaid Wharf. It'd be a shame if all three were even in height. Had to chuckle at this as it reminded me of an utterly inane comment from She Who Must not be Named - ok it was Pam Madoff - a couple of years ago when the "David Foster" walkway concept was getting some serious traction and media play. I'm paraphrasing here but very closely, with regard to our harbour walkway - roughly from Canoe Club to Laurel Point - she made the incredible and bizarre statement that, "its (Victoria's harbour walk)....as good as if not better than anything in Vancouver". At which point whatever little credibility she may have had - on any subject - basically went up in smoke as far as I was concerned. First, in response, I would say get off the crack. Second IMO anyone from the Rock who has never spent any great deal of time in Vancouver, or more specifically actually lived there and knows the landscape intimately, should just ex-nay with the comparison-ay between YVR and Victoria because those folks merely reveal the depth of their ignorance of the topic in all its glory. No one of sound mind and with two eyes that actually work, can ever seriously claim that the pathetic, disjointed, fractured, dirt poor Victoria country bumpkin cousin of a harbour walk can currently be compared with the incomparable, truly world class Vancouver version - which today essentially allows one to walk continuously from Jericho Beach in the Point Grey area through and along Kits Beach and Kits Point and marina though and across Granville Island along the ex-Olympic Village waterfront area to the TELUS Science World, and from there stroll along the north side of False Creek to Second and Third Beaches in and around the West End, to and completely around Stanley friggin' Park! and back along the downtown YVR waterfront at least to the Vancouver T&C Center and Canada Harbour Place and the cruise ship terminal. Favorably comparing our laughing stock 'harbour walk' in its present discombobulated state to Vancouver's is like saying that Elsie the Cow would give a Bugatti Veyron a run for its money. It could happen......but I rather doubt it. But...but.. but... lime green bikes! Edited by VicHockeyFan, 16 September 2017 - 07:31 PM. Dang! Nothing yet on D'Ambrosio's website. What we were able to assess thus far is the project will rise to five-storeys and include a varied assortment of units plus a commercial component at-grade. 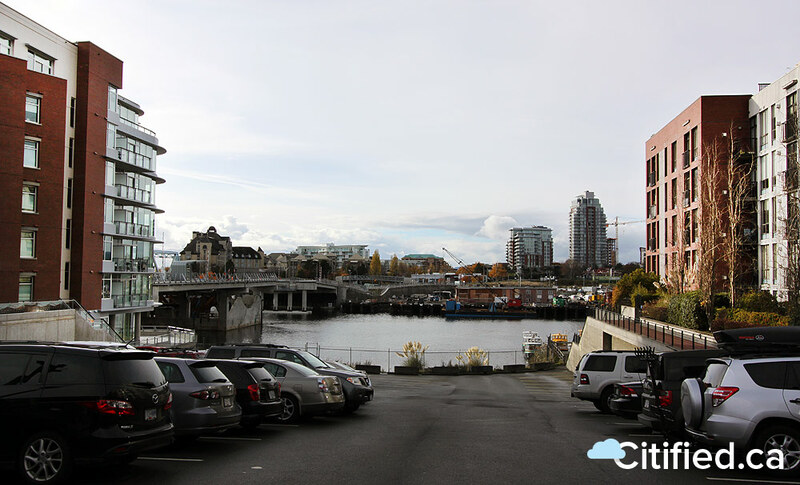 A mixed-use condominium residence and ground floor retail development has been proposed for a surface parking lot at the foot of Fisgard Street in Chinatown. 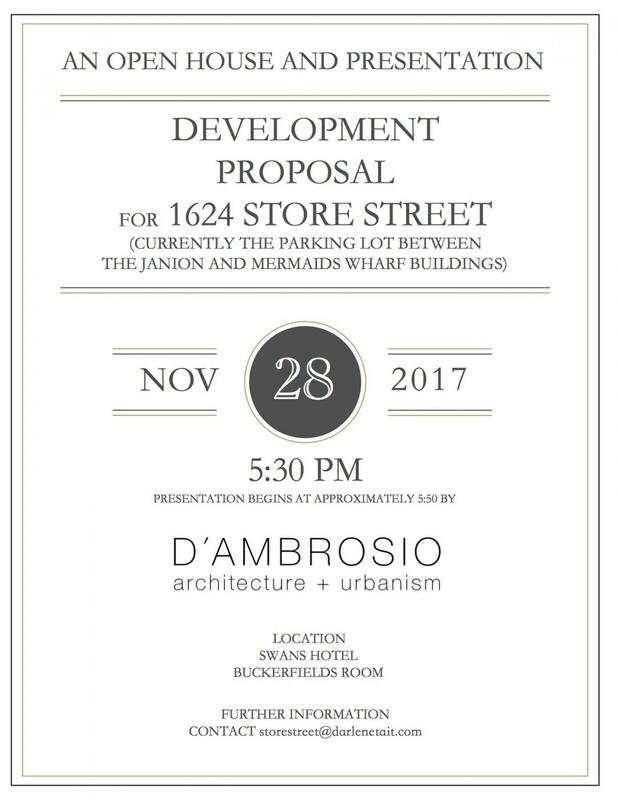 The building will rise to five-storeys between the Janion and Mermaid Wharf projects. If it blocks my view of the Sooke Hills as I walk along Wharf Street, it cannot be allowed to proceed. Edited by Nparker, 18 November 2017 - 09:11 PM. If it blocks my view of the Sooke Hills as I walk along Wharf Street, I cannot be allowed to proceed.